Featuring 8 analog inputs and 4 analog outputs, the IB1004 + SB1004 board combination is ideally suited for industrial (building) control and data acquisition applications. Additional relays and the RS232/485 serial port further expand product capabilities. To improve reliability and conversion precision, the A/D and D/A portions each have their own power/ground domains that are fully isolated from the rest of the circuitry. The IB1004 is the main board in the pair, and is connected to an NB10x0 network board by the IB1000 interboard cable. The SB1004 is a supplementary board, it exists because a single IB1004 would not be able to accommodate all required circuitry and terminal blocks. In the board pair, the IB1004 carries the A/D converter, while the SB1004 contains the D/A converter, RS232/485 port, and 2 low-power relays. The IB1004 and SB1004 are not meant to be used separately and should always be ordered together. The IB1004 product includes the LB1001 LED board. The IB1004 and the LB1001 come assembled together and interconnected by the LC1000 cable. Therefore, you don't need to order the LB1001 and LC1000 separately when purchasing the IB1004 board. All I/O lines of the IB1004 + SB1004 are grouped into four terminal blocks (two per board), with 9 terminals in each block. The boards are controlled by the EM1000 module located on the NB10x0 board. More information on specific IB1004 + SB1004 functionality is found in the Detailed Information section. 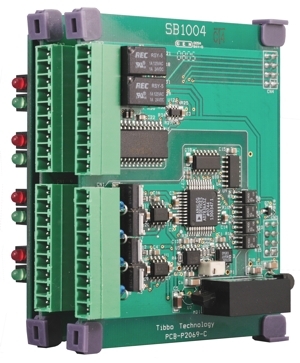 To simplify testing and evaluation of the product use the TB1004 test board.